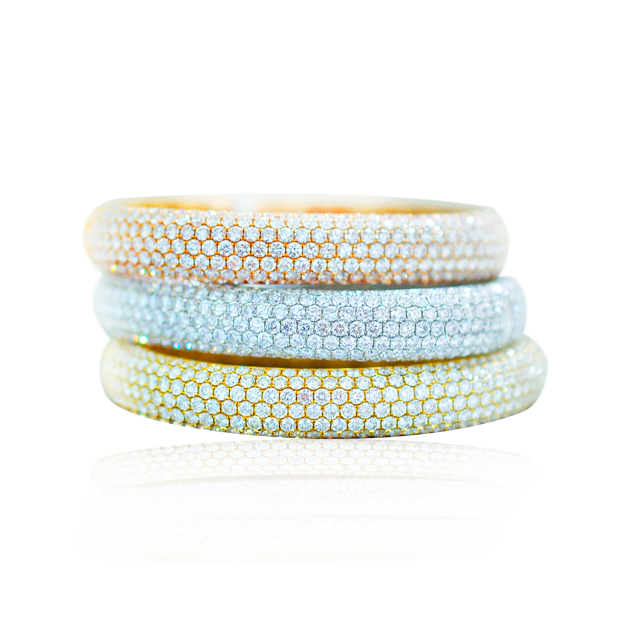 Multi-row pave diamond bangle bracelets available in 18k white gold, rose gold, and yellow gold. These modern pave-set diamond bangle bracelets are in hinged-cuff style and are offered in 18k rose, white, and yellow gold. These bracelets are available with full pave diamonds or half pave diamonds. A perfect addition to any woman’s wardrobe- they are consisted of over 16 carats per bracelet. A simple yet refined design which lets the diamonds be the star of the show. To view these stunning bracelets, please book an appointment at either our Newport Beach or Costa Mesa location, north of Laguna Beach and Corona Del Mar.